Stephen Graham made three long trips to the United States between 1919 and 1923. In the second half of 1919 he toured the southern states of the USA in order to see at first hand the racial divided in the American south. 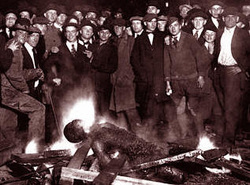 The book describing his journey, Children of the Slaves (The Soul of John Brown in America), was scathing in its denunciation of lynchings (see left) and attitudes of white southerners towards their black neighbours. Stephen was nevertheless often very patronising in his attitude towards the blacks he met, and he hinted at one point that he was not sure they were yet ready to receive the vote. Some of his work was published in Harper's Magazine, but it caused considerable controversy, and the book was not widely reviewed in the USA. Stephen spent most of the winter of 1919-20 in New York, where he and his wife Rosa rented an apartment, and it was during this period that he gained a real entry into the literary world of the city. Amongst those he met was the 'singing poet' Vachel Lindsay, best known for works like The Congo, and the two men quickly became friends. Stephen chaperoned Lindsay and his mother when they visited London in 1920. The two men quickly realised they were kindred spirits - critics of 'modern' civilisation who both espoused a form of Christian faith that was sceptical of doctine - and looked warmly on various forms of eastern thought. Lindsay had for many years tramped the highways of the USA trading his poems for bread. The two men agreed to hike together in Glacier Park in the Rocky Mountains in the summer of 1921. Both Vachel and Stephen wrote books about their hike through Glacier Park. Stephen's Tramping with a Poet in the Rockies covered everything from the beauty of the mountains through to the threat posed by black bears. Vachel wrote a poem-cycle Going-to-the-Sun which created a strange world of fantastic creatures partly-rooted in the landscape of the Rockies. When the two sat around the camp fire at night - Vachel was exhausted from trying to keep up with his friend - they discussed everything from poetry to politics. Together they tried to formulate a kind of personal and political philosophy that rejected the importance of money and the city in favour of one which emphasised small towns and personal friendships. Both men were in a way refugees from modernity - but there was a difference. Stephen was always a practical man despite his sometime visionary philosophy. Vachel was not. They nevertheless kept up a detailed correspondence throughout the 1920s. Vachel took his own life in 1931 by drinking a bottle of Lysol disinfectant, apparently because of money worries, although he had always been frustrated by his failure to communicate his ideas to his fellow countrymen and women. Stephen too, as the next page will show, faced situations in his own life during the 1920s that were to have far-reaching ramifications. 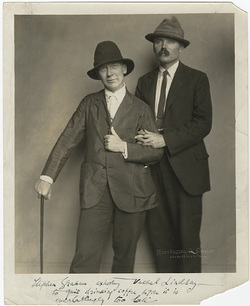 The picture of Stephen and Vachel (left) is taken from the Harry Ransom Center's fascinating online exhibition 'The Greenwich Village Bookshop Door' at http://norman.hrc.utexas.edu/bookshopdoor/#1. 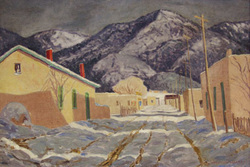 In 1922 Stephen and his wife returned to the United States where they lived for a time in the literary colony at Santa Fe in New Mexico. Stephen left Rosa there for a time to visit Panama where he walked across the isthmus via the Peak of Darien (from where he caught his first glance of the Pacific). In the autumn he was joined by Wilfrid Ewart, who had been his commanding officer in the Scots Guards, and had since written a best-selling war novel Way of Revelation based on his experiences. Stephen and Rosa travelled to Mexico City at the end of December 1922 where they were joined by Ewart. The three of them separated in the early hours of the first day of the 1923, in order to return to their respective hotels. Ewart went out on to his hotel balcony to watch the revelries below, but was shot through the eye by a bullet fired by one of the revellers, apparently dying instantly. Stephen and Rosa arranged Ewart's funeral. Stephen later wrote Ewart's biography (The Life and Last Words of Wilfrid Ewart). He also chronicled his third post-war trip to the New World in his book In Quest of El Dorado. Both Ewart and Graham achieved lasting fame of a sort when the former's death in Mexico City was used as the basis for a novel by the Spanish novelist Javier Marias (Dark Back of Time).